Dr. Valerie grew up in the Naperville area. She received a Bachelor of Science and Master in Public Health degree from the University of Illinois at Urbana-Champaign before continuing on to earn her Doctor of Dental Medicine degree from A.T. Still University, Missouri School of Dentistry and Oral Health. 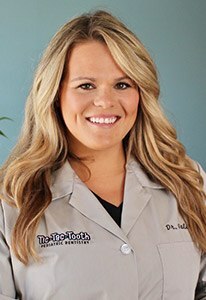 Dr. Valerie has been in the dental field since 2010 when she worked as a dental assistant and grew her love for dentistry. For Dr. Valerie, the best part of practicing pediatric dentistry is being able to educate her patients on how to care for their teeth and helping them maintain a happy and healthy smile! In her free time, you can find Dr. Valerie cheering on the Chicago Cubs & exploring new parts of the city. She enjoys spending as much time as possible with her family & friends, her puppy (Renny) and her bunny (Styles). Dr. Valerie also loves traveling and wants to see as much of the world as possible-her most recent trip was to Australia! Dr. Valerie is a certified Invisalign provider and a member of the Chicago Dental Society, Illinois State Dental Society and the American Dental Association.